In the 1970's, if you wanted to be bitchin', you bought a van. If you wanted to be wicked, you bought a van and airbrushed a wizard on the side of it. Well, it's 2013 and you can forget the van. Just get the wizard tattooed on you! 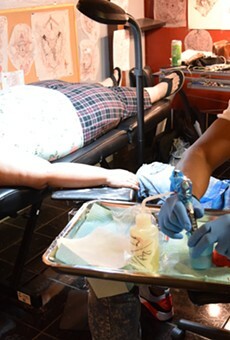 Look no further than Black Rose Tattooers, the cozy shop on the corner of Sixth Avenue and Broadway that's been there since 1995. The magicians inside would be more than happy to change your flesh into a thorough and beautiful work of art. If you want a body part pierced, they can do that too, but maybe call beforehand if you want that "Magic cross" piercing. Kazam! — Better you than us: One vote for "any mobile tattoo parlor that pops up on a random corner"
— If this is actually a thing that exists, let us know: One vote for "Phallus and Gromit"